Six centuries before the birth of Christ, people began to imagine an immense land at the bottom of the world, a land of marvels, of enormous wealth and mystery. 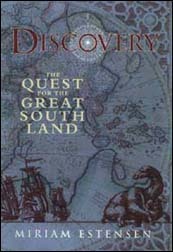 Discovery is the story of the quest which compelled men in small ships to traverse unknown seas, to endure extraordinary hardships, to slowly unveil the sixth continent. The story begins among Greek philosophers on the shores of the Mediterranean. It ends two millennia later in the vast Southern Ocean. Lucidly and concisely, Miriam Estensen tells an absorbing tale of mapmakers and lonely caravels, Spanish hidalgos and Dutch merchants, remote coasts and castaways, buccaneers and dreamers. At the heart of Discovery is the power of a myth and the adventures and sacrifices of those who pursued it, for this is the story of how an imagined place was made real, how the speculations of visionaries became Terra Incognita and then Australia.